Pixel Dust Photo Art: Free Texture Alert! Hi Everyone! Hope you are all finding ways to stay cool, calm and collected during this heat wave. I'm blessed with 'air' and am so grateful. After I give a long, slightly cool drink of water to my outdoor potted plants, I plan to work indoors today. Tomorrow evening the doors to our virtual art gallery open. Are you ready to hang your photo art? You can hang anything you feel qualifies as 'artful' and we also have the prompt to hang a vintage-looking piece of photo art. 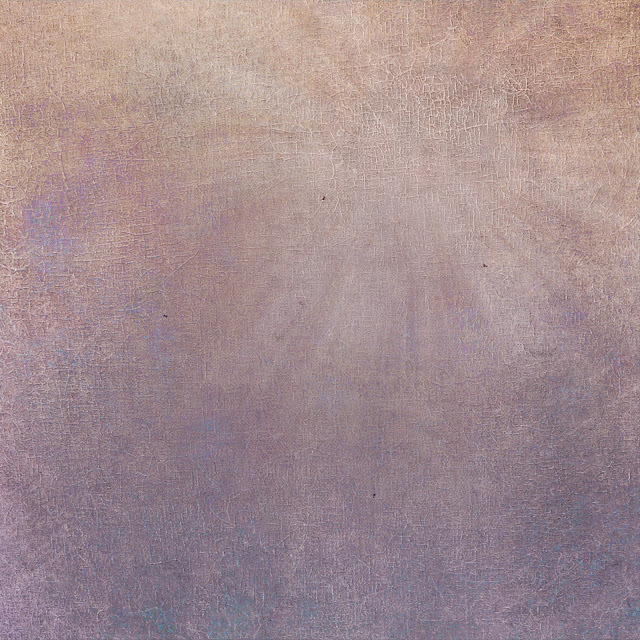 To download a free, high resolution copy of pdpa Vintage Craquelure texture, click HERE. Three of the last four textures offered here as freebies (Nitty Gritty, Age It and Vintage Craquelure) are all great for giving any photograph a vintage feel. So with them and the skills you have tucked up your artistic sleeve you should be able to produce some great vintage pieces to share tomorrow. After edits to fade and blur the photograph, I added pdpa Vintage Craquelure texture blending it in Hard Light and reducing the opacity of the blend to 80%. 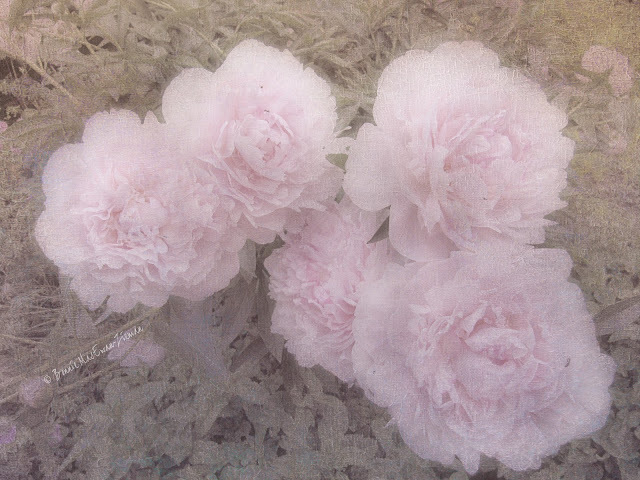 A layer mask was used to remove only some of the texture from the flower (using a soft brush at 15% opacity). Again after edits to desaturate and blur the photograph, pdpa Vintage Craquelure texture was added and blended in Multiply, Opacity 75%. A layer mask was used to remove some of texture from the flowers only, as described above. I'll be looking for you tomorrow at Photo Art Friday! Thanks, Bonnie! That's a lovely texture. Like what you did with it too! These are lovely. I really like the one with all the peonies. So soft. Thanks for a great texture. 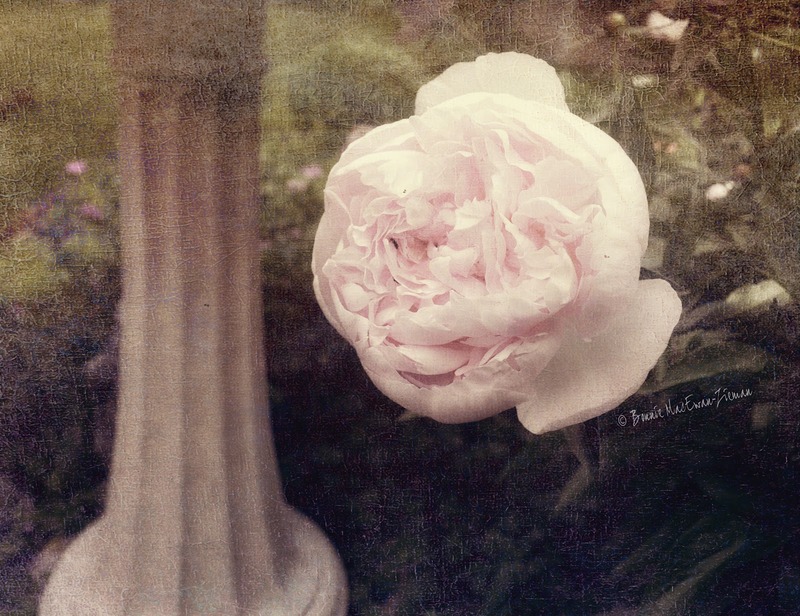 I didn't see the second image until I had tried the texture on one of my own peony images! They are ethereal! That's an AMAZING texture Bonnie, thank you! Love the texture!!! Thank you so much for sharing it! Thank you Bonnie. I love it! Awesome texture, thank you very much!